USU team analyzed light to date the Great Gallery panel and concluded the pictographs are at most 2,000 years old. Al Hartmann | The Salt Lake Tribune Using luminescence dating techniques, USU researchers have determined the pictographs at the Great Gallery in Canyonlands National Park's Horseshoe Canyon are far younger, perhaps 1,000 to 2,000 years old, than previously believed. (Joel Pederson | Utah State University) Using luminescence dating techniques, USU researchers have determined the pictographs at the Great Gallery in Canyonlands National Park's Horseshoe Canyon are far younger, perhaps 1,000 to 2,000 years old, than previously believed. (Joel Pederson | Utah State University) Using luminescence dating techniques, a USU research team led by geologist Joel Pederson, have determined the pictographs at the Great Gallery in Canyonlands National Park's Horseshoe Canyon are far younger, perhaps 1,000 to 2,000 years old, than previously believed. (Joel Pederson | Utah State University) Using luminescence dating techniques, USU researchers have determined the pictographs at the Great Gallery in Canyonlands National Park's Horseshoe Canyon are far younger, perhaps 1,000 to 2,000 years old, than previously believed. A study by Utah State University scientists could shed new light on the ancient culture or cultures that created the haunting rock art known as the Barrier Canyon Style. 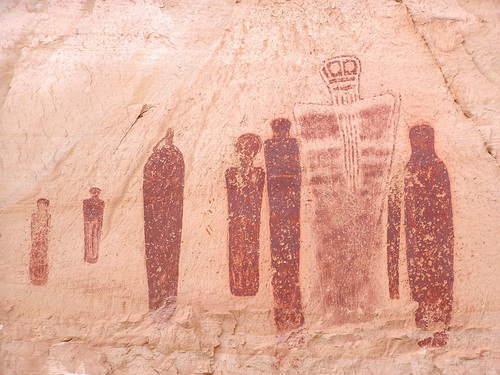 These paintings are known for their tapered life-size anthropomorphic figures, suspended on canyon walls around the Colorado Plateau like spirits and limbless space aliens holding court. A revered section of the Great Gallery, the grandest expression of the style, was painted between 900 and 2,000 years ago in what is now Canyonlands National Park&apos;s Horseshoe Canyon, concluded researchers led by geologist Joel Pederson. That&apos;s centuries later than when many scholars believe the Barrier Canyon Style reached its zenith, suggesting the style could have persisted for several thousand years and was used by different cultural groups, according to Steven Simms, a USU anthropologist and co-author on a study published Monday in the Proceedings of the National Academy of Sciences. The study offers evidence that there was no tidy succession of cultures and instead an ethnic mixing occurred, with the in-migration of groups from the south who brought new technologies that would transform human communities. "What makes it interesting," Simms said, "is that period is a time of great demographic, economic and social change with the arrival of the agriculture on the Colorado Plateau, and the arrival of the bow and arrow." Rock art is resistant to scientific dating because its pigments typically lack enough of the organic material required for radiocarbon analysis. So Pederson used a dating technique called optically stimulated luminescence, or OSL, which determines when sand grains were last exposed to sunlight. His aim was not to date the images themselves, but the movement of sediments and rock around them to identify a window in time in which they could have been painted. But some rock art experts have their doubts about his findings. David Sucec, a Salt Lake City artist, contends previous dating efforts support the theory that the Great Gallery dates back several millennia. He points to the "horseshoe shouldered" clay figurines recovered from two caves eight miles up the canyon from the gallery in 1975. The artifacts, which match Barrier Canyon anthropomorphic images, were found in strata that is 7,000 years old, said Sucec, a founder of the BCS Project, a Utah group devoted to the study and preservation of Barrier Canyon Style art. Pederson cautioned that his study doesn&apos;t date the style as a whole, but just one famous example of it, and he is seeking funding to analyze other panels. 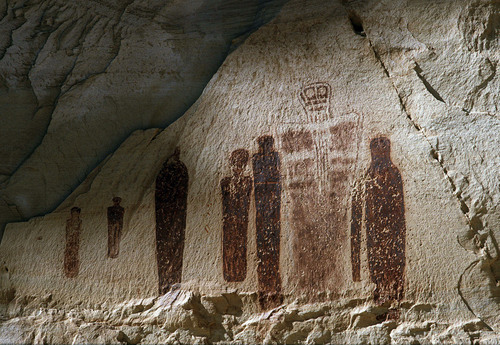 Horseshoe Canyon is among Utah&apos;s most closely studied archaeological areas. It was added to the national park as a detached unit in 1971 in an effort to safeguard its cultural heritage, but that didn&apos;t spare nearby caves from looters. The remote spot is a few miles west of the main park&apos;s northwest corner in Wayne County, about 30 miles east of Hanksville. The canyon is locally known as Barrier Canyon, a name that stuck when archaeologist Polly Schaafsma formally recognized these paintings as a distinct style. Barrier Canyon art, which Sucec and his collaborators have documented in nearly 400 sites, long has been associated with Archaic cultures, about which little is known. Their art is about all that&apos;s left of their time here. "They were exceptional image makers. They paid careful attention to how the paint was applied," Sucec said. "Most all of the images are symmetrical. If you could fold them in half, the left side would be identical to the right side." The ages of specific examples the Barrier Canyon Style are much debated among those who study rock art, with some estimates for the style&apos;s origin going back as far as 8,000 years. Using OSL, Pederson&apos;s team reconstructed the sedimentation process along the canyon wall under the Great Gallery. He concluded it would have been impossible for these paintings to be older than 6,000 years because the wall was encased in sand and gravel back then. But his research went further, determining how long the rock face holding the Holy Ghost panel had been exposed between two rockfall events, which he concluded were 700 years apart. The team first examined the debris from a rockfall that took out part of the panel. Analyzing the panel pieces facing into the dirt, the team determined those rocks fell 900 years ago. That date was confirmed with radiocarbon analysis on leaves discovered under the rocks. "We lifted this rock at nighttime and there was a handful of cottonwood leaves. They were buried when the rockfall hit them," Pederson said. "That was pure serendipity." These findings meant that the paintings were created no later than A.D. 1100, which was not a surprising result. Then Pederson pinpointed when an earlier rockfall occurred, surmising that the Holy Ghost and figures hovering around it were painted between these two events. Using a cutting-edge application of OSL developed by colleagues in Denmark, the USU team determined that this surface was exposed 700 to 1,000 years earlier. 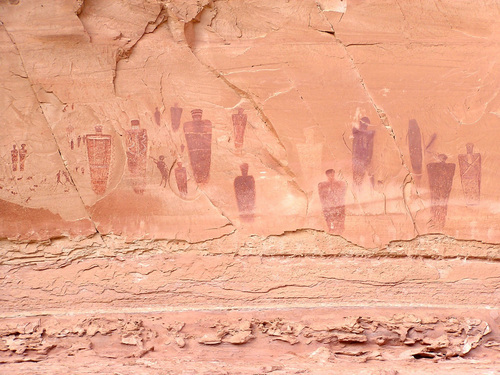 These findings open the intriguing possibility that people who painted Barrier Canyon art shared the landscape with the Fremont. 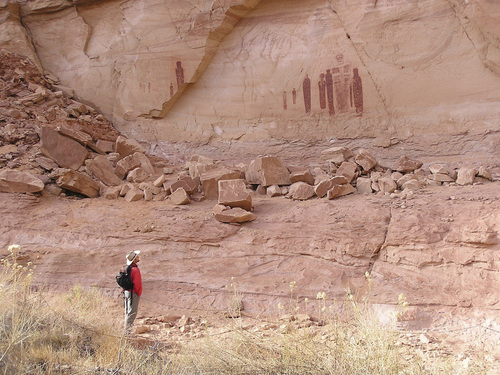 These ancient Indians occupied southern and eastern Utah from about A.D. 400 to 1300 and left a rich archaeological record that includes petroglyphs, images pecked into rock in a style much different than Barrier Canyon.